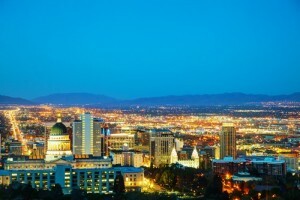 Known as the Crossroads of the West for its central location, Salt Lake City has a one-to-two-day access to half the nation’s population, making it a convenient site for product distribution. Utah’s capital also has the unique claim of having the country’s greatest number of bilingual speakers. As headquarters of The Church of Jesus Christ of Latter-day Saints, many of its members learned a second language at Brigham Young University to prepare for missionary service. Salt Lake City is renowned for great snow conditions and outdoor recreation. With the Wasatch Mountain Range to its back, Salt Lake City offers a dozen world class ski resorts (most within an hour’s drive) and it’s not far from many of the nation’s most outstanding national parks. According to a Gallop study, Salt Lake City is tied with Austin, Texas for the highest job creation scores among the country’s 50 largest metro areas. In fact, since 2013, Salt Lake City has had a job growth rate nearly double the national average. “Salt Lake City may be increasingly attractive destinations for tech workers, given salaries that are becoming more competitive for the industry, along with a much lower cost of living than in California,” the Gallop report says. Salt Lake City’s cost of living is about 6 percent below the national average. The median home price is roughly $243,300 and its electricity rates are among the lowest in the nation. That plays nicely with a median household income of about $60,000. Promising startups will appreciate the Centers of Excellence Program, a state-sponsored grant program to promote the commercialization of new technologies that has created more than 2,000 new high paying jobs across Utah. Employees will appreciate the region’s light rail systems, such as the UTA FrontRunner, a commuter rail line that serves a 40-mile corridor from Ogden, to Salt Lake City and Provo and includes the Salt Lake City International Airport. Startup resources include Grow Utah Ventures, which helps businesses transition from startup to the early stages of business growth. Venture capitalists invested nearly $1 billion in local startups last year, “making Salt Lake City tops nationally in dollar-per-deal average,” according to Entrepreneur Magazine. Adobe, Workday, eBay, Intel, and 3M are a handful of high-tech firms with a large presence in the city’s suburbs. SolarWinds, a top ranked network management software company, is building an operations hub in Salt Lake City that will create 1,040 jobs. It selected the area in part because of Utah’s Economic Development Tax Increment Financing, which will provide the company with a $32.8 million post-performance refundable tax credit. If you’d like to have a presence in the Salt Lake City, Utah area for your business, you can seem more approachable by selecting a local phone number with either area code 801 or the 385 area code. With Halloo you can route calls to your employees anywhere. Get your local phone number today!